Planning a funeral for a loved one will be one of the hardest experiences you will ever have to face. This challenge can be made more complex, and more emotionally and physically exhausting, if you are making arrangements from afar. You’ve been a long-distance caregiver for a while now, and you are used to caring for a loved one from afar. You’ve become familiar with the voices of doctors, nurses, drivers, therapists, housekeepers and everyone else you have entrusted with the care of your relative. But now, you’ve reached uncharted territory. Planning for a funeral can take a lot of time and energy. It’s obviously easier when you know your options, but with an out-of-town service, there is a lot of uncertainty. As the designated caregiver, you may be wondering how you can honor your loved one in a way that he or she would have wanted. This can make you feel more anxious, stressed and unsettled, especially if you have never been responsible for making arrangements. This can be a difficult time with raw emotions, which can be made even more upsetting if you’re living at a distance. After your loved one passes away, the first thing you need to do is report the death to the proper authorities. This step must happen in order to receive a death certificate, which you need in order to plan the funeral, settle the estate and wrap up financial affairs. If your loved one was in the hospital or a nursing home, talk with the staff over the phone to get help reporting the death. If not, you can call a mortuary to pick up your loved one’s body. If you can’t determine that information from a distance, you can simply call 9-1-1. However you go about reporting the death, be sure to inform them if the person was an organ donor or not. Learn more about what to do when a loved one dies. Work with a funeral home with experience helping people plan funerals remotely. Many will provide comprehensive services, meaning they can make the catering, florist and other service provider arrangements for you. If possible, see if you can make one payment through the funeral home instead of multiple payments for each service. Choose the right cemetery – for example, you may select a cemetery specifically for those who served in the military, if your departed loved one was an active service member or a veteran. Get price quotes from multiple funeral homes to compare services, packages and costs. Talk with other loved ones about determining priorities, such as religious or cultural considerations. Visit the websites of various funeral homes to get a sense of what they offer and what you need. Receive quotes over the phone. Obtain a written, itemized price list. Purchase only what you want. Have the body cremated in an alternative container rather than a casket. 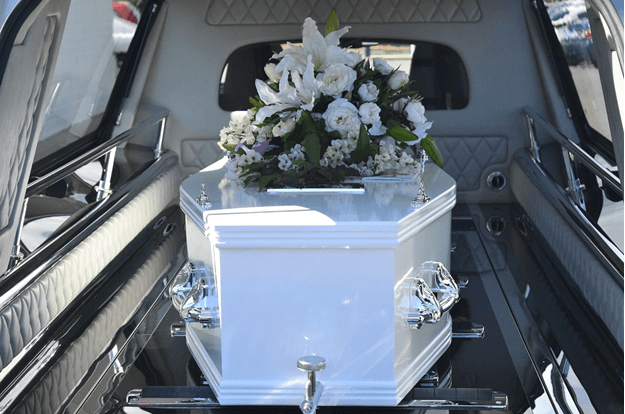 Use a casket or urn you bought from a different company without suffering additional fees. Receive a written statement of purchases before you pay. Again, it is important that you look into the requirements and regulations for the state where your loved one will be buried. There may be other options to consider as well. When you are ready to plan your loved one’s service, you’ll want to start with their wishes. He or she may have written directives where a funeral service is concerned. If not, you’ll have to think about how their beliefs, values and priorities can inform the arrangements you plan. A visitation the evening before the funeral, where people come to pay their respects to the family and honor the deceased. This may display an open or closed casket. A religious ceremony before the funeral service, such as a Catholic Mass at the deceased’s church before the burial. A non-religious service that has a few readings and a eulogy, and highlights the person’s life. A memorial service that occurs after the deceased’s body has been laid to rest or cremated. A lunch or dinner after the services in the home of the deceased, in the place of worship, or at the funeral home. When you are speaking with funeral homes, seek out one that can handle printing materials, accepting deliveries and managing the minutia so you don’t have to worry about the small details from afar. Calling various florists for flowers for the service and grave site. Listing options for people to donate to a charity in memory of the deceased. Asking the funeral home to set up remote-conferencing technology so out-of-town friends and family can use webcams to participate in the service. Connecting with local restaurants to provide food, beverages and a location for a reception after the service. Asking the funeral home about ongoing gravesite maintenance, including placing fresh flowers at the burial site. Whether you have instructions from your loved one or you must make all the decisions on your own, planning a funeral remotely poses its own unique challenges. It’s important you have a support network to rely on so that you don’t feel overwhelmed during this highly-emotional time. It’s easy to put up the blinders and focus so much on the arrangements that you avoid working through the grieving process. Be sure to take time to prioritize self-care and seek help when you need it. Give yourself time to work through your grief so you can find a sense of peace and closure after suffering a loss.